You surely are lucky and you deserve it!!! I would LOVE to get my sewing room organized again. It seems I just get it usable and then something happens (like Christmas) and it gets piled up with boxes again. I was going to ask for the pizza crust recipe but now I’m just trying to figure out how I can get someone to come to my house and serve me lobster mac and wine this weekend! 8. Bring Dave when you come to visit! Wow-your Saturday lunch sounds divine! 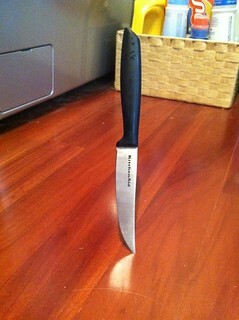 Wow, you are lucky with the hidden knife incident. I agree with you and Joyce about negativity. By the way, my plan is to organize my CD collection by scaling it down to less than 100. I currently have over 500 CDs. My plan is to sell the ones I no longer want to keep, but rip the songs from those to a computer so I have them. My other half is known to wait on people like this. And he does make a mean grilled cheese. My house is soooo disorganized.